Named one of the Best Debut Novels of 2017 by Suspense Magazine! Twenty-something bartender Jason Bishop’s world is shattered when his estranged father commits suicide, but the greater shock comes when he learns his father was a secret agent in the employ of the Invisible Hand; an ancient society of spies wielding magic in a centuries-spanning war. Now the Golden Dawn—the shadowy cabal of witches and warlocks responsible for Daniel Bishop’s murder, and the death of Jason’s mother years before—have Jason in their sights. His survival will depend on mastering his own dormant magic abilities; provided he makes it through the training. From New York, to Paris, to worlds between worlds, Jason's journey through the realm of magic will be fraught with peril. But with enemies and allies on both sides of this war, whom can he trust? The Invisible Hand, who’ve been more of a family than his own family ever was? The Golden Dawn, who may know the secrets behind his mysterious lineage? For Jason Bishop, only one thing is for certain; the magic he has slowly been mastering is telling him not to trust anybody. Brad Abraham is a writer whose previous work includes the feature films Fresh Meat and Stonehenge Apocalypse, as well as the TV miniseries Robocop Prime Directives. He is creator of the acclaimed comic book series Mixtape, has written for such publications as Dreamwatch, Starburst, and Fangoria, and was a long-time contributor to Rue Morgue Magazine. A native of Ottawa, Canada, he lives in NYC. 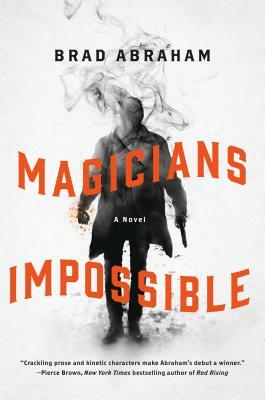 Magicians Impossible is his first novel.